This is the last weekend before my upcoming weekend in Bali, and I need all the practice I can get with my drone before the trip. So I packed my DJI Mavic Pro in my small LowePro camera bag and headed out to the southside of Hong Kong Island. I met up with Kung Fu Panda who suggested Cheshire Home as a good vantage point. We parked at the end of Chung Hom Kok Road, and launched the drone from a platform at the barbecue pits in Chung Hom Kok Park. With unobstructed views of the ocean, it was indeed a good place for this purpose. I had taken plenty of pictures of Chung Hom Wan - during the day and also at sunset - and always had Round Island in those pictures. 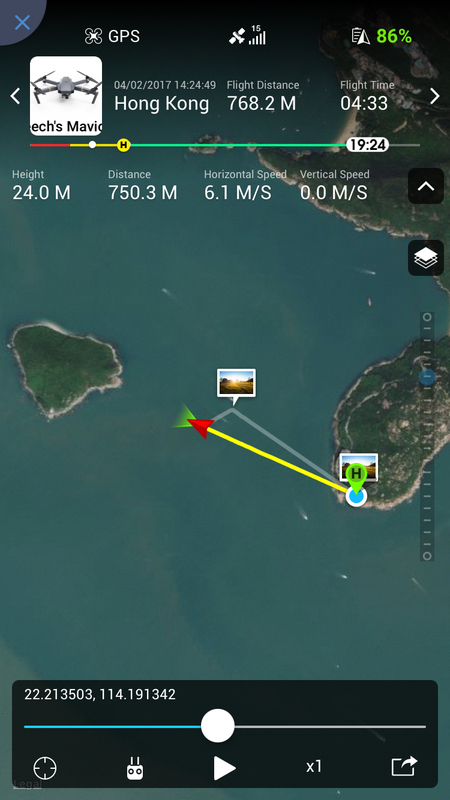 So I started by sending the drone out by having it face Round Island, then using the TapFly mode and sending it heading straight for the island. One problem with this mode is that when the target has a height which is lower than the cruising altitude of the drone, at some point the drone will automatically start descending. For a newbie like myself, this was somewhat disconcerting... so I turned back to flying manually. However, since I had sent the drone off in a direction where it was obscured by the rocks surrounding my location, I was soon getting warnings on my remote control that the signal was weak - on top of those telling me that the winds were strong. I decided not to fly all the way to Round Island and started pulling the drone back. At some point, though, the signal was completely lost - to the point where the live video feed was cut off. This was when the return-to-home mode was automatically triggered, and the Mavic Pro started coming back to its home point. Thankfully there was still plenty of juice left in the batteries, and the drone came back without any problems. We decided to move to a different and better vantage point - this time the waterworks facilities on the hill above Headland Road. From there I sent the Mavic Pro flying south towards Stanley, then turning back towards Chung Hom Kok. I let the drone circle around the area, filming footage of a few friend's houses so I could send pictures to them later. I'm pretty sure some of them haven't seen their houses from that angle! I decided to end the session early since I was meeting a friend for coffee. But even flying the drone for a short while on the south side makes one realize how beautiful Hong Kong is. Imma make it a point to get out to the countryside more this year so I can fly the drone and document the beauty of these territories.